♥ Description: This is for one jar. Super cute white glass jar. 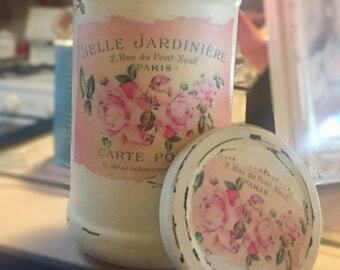 Handpainted and decoupage. .All background items, props, decor, etc., are not included. Our handcrafted items are from salvaged recycled materials, then "upcycled", altered, repurposed, embellished and made pretty for you! 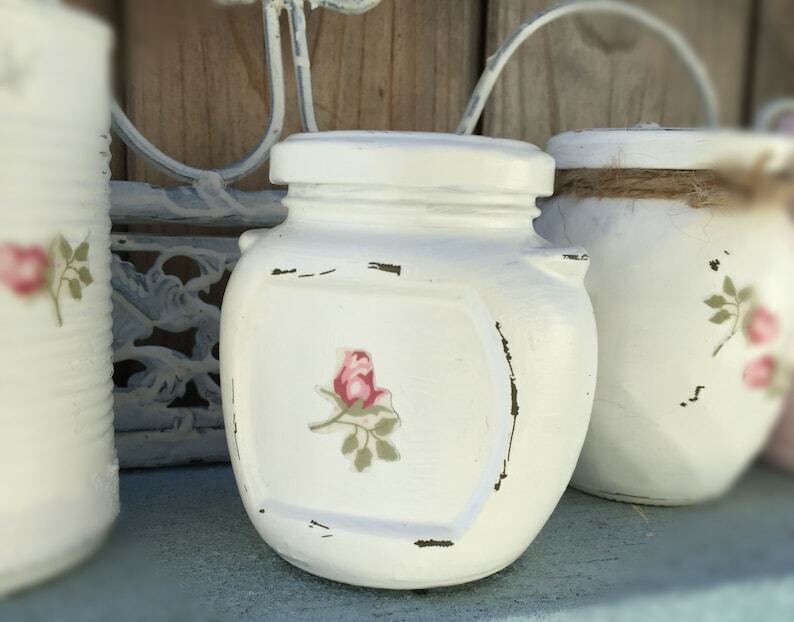 Keep in mind, that your item is most likely from recycled salvaged materials and may show signs of little wear, rust, dents, but that adds to the rustic, shabby chic charm. Water based acrylic paint is used, so please do not submerge in water, however, you can fill inside with water for fresh flowers. ♥ Uses: Storage, home, office, nursery, dorm decor, table decor, fill with your favorite candy and gift it, or simply set out for instant shabby chic charm. ♥ Color: White. Please note color tones can vary from monitor to monitor but should be reasonably close, if not exact, to what is shown. I use natural lighting to show true details. ♥ Measurements: 3.5" x 3.5"
Beautiful! And I got an unexpected surprise! Excellent customer service.